EUSD trustee Jose Fragozo at his residence attending a board meeting by phone last week. Forget about basketball courts, the Escondido Union School District (EUSD) is playing its games this month at Vista Superior Court. Judge Richard Whitney in Department 21 may make his ruling at any time, but clearly nobody truly will be called a winner. In any event, without a settlement, the court dispute could last past Valentine’s Day, fittingly enough. With Whitney more like a school yard referee patiently reffing the school grounds brawl, attorneys have been squaring off over accusations of bad behavior and dicey academic play calling. Meantime, the EUSD Board of Directors have become embroiled in contentious meeting after contentious meeting. Trustee Jose Fragozo, the only Latino member of the 5-member school board governing a 70 percent Hispanic district, has been temporarily restrained by court order from coming within 300 yards of any school facility based on a complaint filed by superintendent Luis Rankins-Ibarra along with four other school administrators. Several meetings in December and January were interrupted with threats from the audience to litigate over alleged violations of the Brown Act, the state’s open public meetings laws, including not giving enough advanced notice of the meeting and making them inaccessible to handicapped people. Newly selected Board president Joan Gardner actually adjourned one December meeting after those allegations without discussing any actual school business. Another lawsuit was threatened by a Poway school activist alleging EUSD violated the Brown Act at its last regular board meeting on Thursday, Jan. 14. 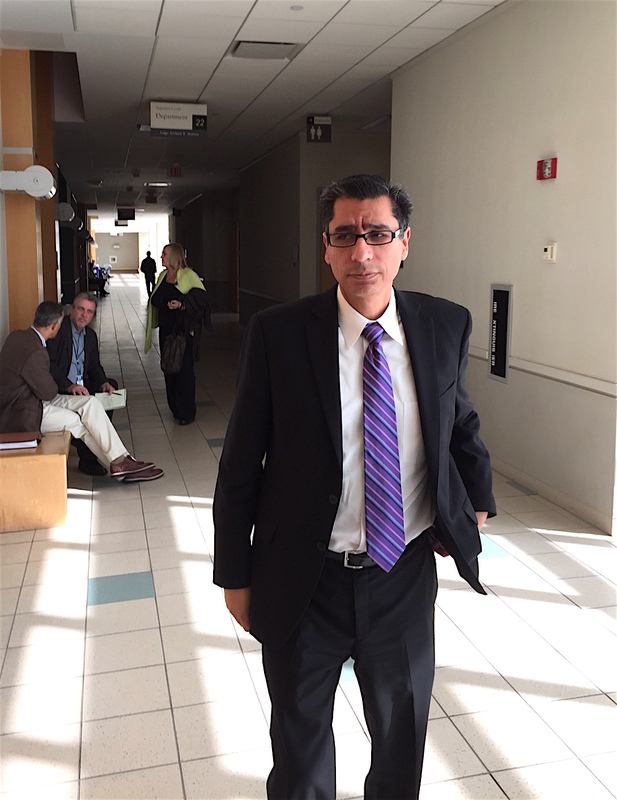 EUSD Superintendent Luis Ibarra at the Vista courthouse last week during a break in his testimony against Jose Fragozo. In that Venn diagram of school district affairs, where low academic achievement and declining enrollment numbers and revenue meets District leadership and Board management dysfunction, actual work on issues related to student experience appears to have gone by the wayside. With the next Board meeting scheduled for Feb. 11, center court has moved to Vista Superior Court where a dozen witnesses were scheduled to appear before Whitney’s ruling on lifting the temporary restraining order or making some other kind of arrangement. Fragozo’s attorney Laura J. Farris peppered Ibarra with questions about his motivations in taking such a drastic action as taking out a restraining order against one of his theoretical bosses, a Board trustee. Ibarra said he felt threatened because Fragozo kept asking him questions through emails that sounded hostile. However, he said Fragozo never threatened him with any physical violence. Ibarra said he sent out letters to district parents and continues to post a message saying Fragozo had threatened dsitrict staff. However, that letter quotes his complaint while phrasing it to sound like it came from a judge. One major assertion by Ibarra is he felt threatened when Fragozo said he was coming to the superintendent to pick up his board packet when the board packet wasn’t delivered to the trustee. “If you don’t do what I ask of you I am coming after you.” Ibarra said Fragozo said. Later however, after Ibarra said he just wanted Fragozo to stop emailing him, he said he felt threatened when Fragozo stopped emailing him. Farris pointed out that contradiction. In any event, Fragozo denies any wrongdoing saying he had honest disagreements over policy and was being scapegoated in an attempt to silence him. A final development in Ibarra’s testimony was that during a meeting Leila Sackfield, deputy superintendent in charge f educational services whom Fragozo repeatedly had criticized and south replaced, Fragozo never threatened violence or raised a finger while Sackfield became enraged and pounded her hand on a table. School Board officials wanted a deal. They would drop the restraining order pursuit if Fragozo agreed to a three-month cooling down period during which he wouldn’t participate in school district affairs. He refused. Three other district executives joined Rankins-Ibarra in the complaint: Kevin Rubow, assistant superintendent of human resources; Sackfield, and Kelly Prins, assistant superintendent in charge of student support services. They were scheduled to testify in the court hearing late Friday. 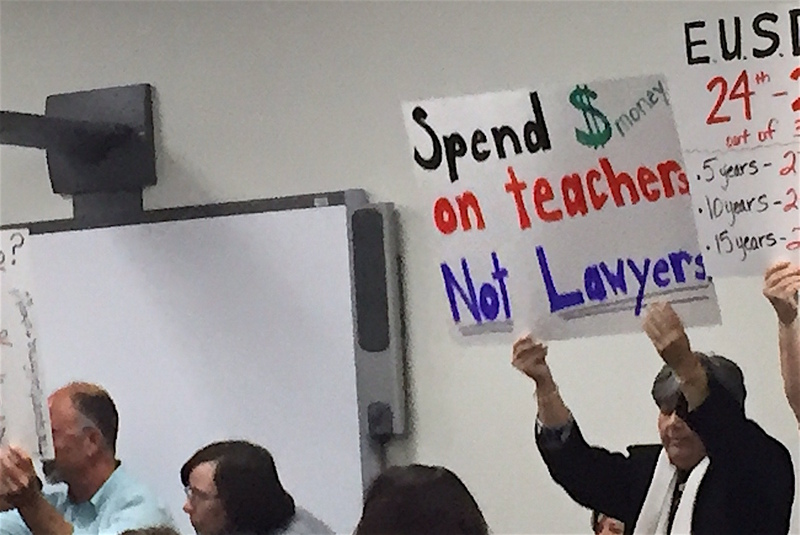 Teachers and supporters protest low wages at last EUSD Board meeting. Deeply divided and torn asunder, the dysfunction that is the Escondido Union School District (EUSD) was in full public display on Thursday. It wasn’t a pretty sight and spoiler alert, the end of the educational turmoil is far from near. Teachers practically in full revolt over salaries. Allegations of violations of state public meeting laws. One board trustee sent to exile miles away. Discordant discussions of steep school enrollment declines. Another board trustee bursting into tears. EUSD entered a kind of “Alice in Wonderland” scenario for a six hour board meeting featuring the voice of EUSD trustee Jose Fragozo. The exiled trustee attended, if one call it that, through a HAL-like — for “2001: A Space Odyssey” fans — phone connection. Often times, the phone cut out or sounded like voices from the underwater deep or at a cavernous airport. A highly controversial temporary restraining order filed by EUSD superintendent Luis Rankins-Ibarra, deputy superintendent Leila Sackfield, assistant superintendents Kelly Prins and Kevin Rubow and publicly supported by Paulette Donnellon, against Fragozo necessitated his phone-only participation. They said he approached them in a threatening manner on numerous occasions. He said he simply was disagreeing with them on policy and never crossed any lines. While Fragozo couldn’t attend, his shadow loomed large across the Board’s Aldergrove Avenue meeting room. Numerous supporters assailed school board trustees sitting at the regular board meeting room over the restraining order and district policies. Department 21 of Vista Superior Court to attempt to work out some kind of settlement of their disputes. It was a long day’s journey into night Thursday for the embattled school district as trustees began their journey through the looking glass at 5 p.m. with a session behind closed doors. That wasn’t even the controversial part of the evening, not even close. Fireworks ensued in earnest during public comments when representatives of about 100 sign-carrying district teachers at the meeting began a long critique of board trustees over low teacher salaries, despite top administrator salaries that are among the highest in San Diego County. Wrapped up in the long chorus of criticisms of board action was the Fragozo affair, that some historical types compared to The Dreyfus Affair during which justice was miscarried in late 19th Century France. The only Latino representative on the five-member board in a majority-Latino district, supporters loudly defended the absent trustee throughout the evening. Fragozo couldn’t do that in person himself, obviously. However, he had, for what it was worth, supporters galore lambasting his fellow school board trustees for a litany of institutional failures. Supporters allege Fragozo was scapegoated for pointing out and attempting to address issues drilling down to the district’s very DNA. Chris Garnier followed suit with accusations of violations of the Brown Act, California’s open meetings law. However, it took several minutes of back-and-forth between Garnier and EUSD Board president Joan Gardner before Garnier’s points could be made. With supporters saying, “Let him speak,” Garnier eventually was allowed to proceed. Don Arballo, head of the Escondido Elementary Educators Association, followed with a challenge to school administrators. While he noted teachers deserved a 20 percent salary increase since they were underpaid compared to other districts, he asked Ibarra to take a 20 percent salary cut that would move him just one notch down in the highest paid county school superintendent list. 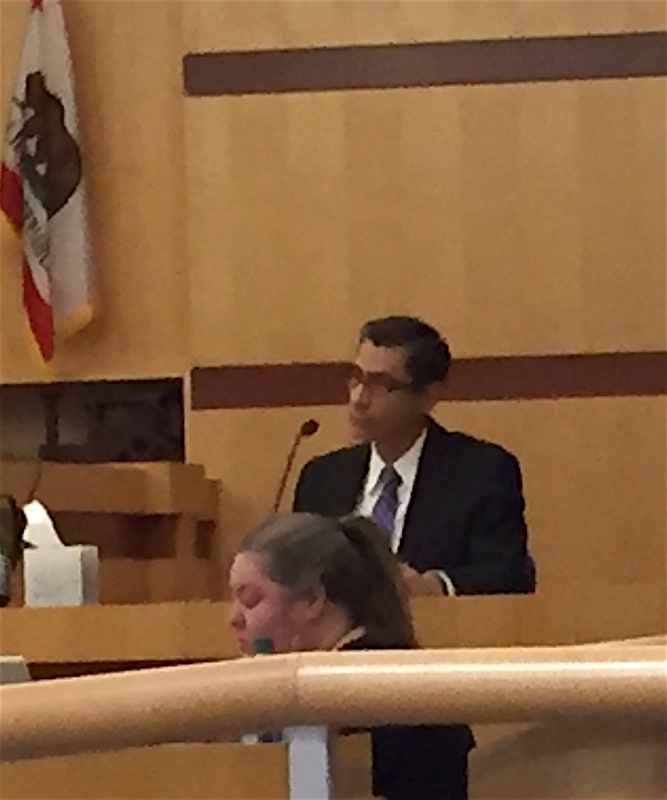 Rankins-Ibarra on the witness stand before Superior Court Judge Richard S. Whitney last week. With that, it was time for recess, although that may be a foreign concept in a district divided like two Koreas. Gardner and Fragozo — on the phone speaker — went back and forth on the sound quality of the unique board call-in concept. Eventually that was resolved, somewhat, the board went back into session and actually began discussions of educational matters. It was a tale of two rooms, one large and one small. As about 20 people remained in the huge board meeting room, Fragozo held sway in a small one-bedroom apartment about two miles away. With a laptop computer and iPhone, he tried to follow the meeting through a glass darkly. This was the other end of the rabbit’s hole with sound surging and fading through the remainder of the night. Sometimes, gurgled transmissions from the board meeting were impossible to follow. Fragozo strained and spoke as the meeting drummed along. A key factor in discussion about teacher salaries and educational priorities revolved around the bleak portrait of shrinking district enrollment despite increases countywide in student populations. Observers said this went to the heart of the restraining order dispute and other district arguments over salaries and educational priorities. Michael Taylor, EUSD assistant superintendent for business services, said enrollment numbers dictated 80 percent of district revenues. Enrollment, reportedly, had dropped from 20,000 students in the K-8 district in the last 10 years and was stagnant from 2004 to 2010, he said. Fragozo said this all-important discussion was carrying on past 10:30 p.m. when most everyone had left the meeting and urged it be placed on the next agenda earlier in the evening. “It’s really unfair to talk about something so important at 10:30 p.m.,” he said. The meeting continued with consent agenda items and the likes, but Alice long since had fallen through the rabbit hole. Next scheduled EUSD board meeting is Feb. 11. Between that time a Superior Court judge will rule on the Fragozo affair and the board may, or may not, be subject to additional open public meeting laws litigation. So far, the only ones who appear to be winning this war of wills are the attorneys. Otherwise, the beat goes on. 3 Comments on "Escondido Union School District under fire"
The abuse of power is off the charts at Escondido Union School District. Trustee Fragozo’s voice is silenced while Superintend Ibarra, Trustees Harper and Donnellon give laughable testimony. Trustee Harper admitted, under oath, that board and cabinet members roll their eyes and show disrespect to the man who would have been the first Latino Board President had the others not come together to prevent it. Trustee Donnellon said, under oath, she was not afraid of Trustee Fragozo because he does not have the ability to fire her. There are serious problems at EUSD and those in charge of fixing the problems are the very people who making existing problems much worse. This is not rocket science; give those teachers a significant raise and in good faith, Superintendent Ibarra and others should take a pay cut. Also, everyone involved in the Restraining Order fiasco with Trustee Fragozo should apologize to not only him, but to the whole community. The kids need to come first. The kids cannot come first when district leaders are taking advantage of the teachers the way they are. Any board member who claims they want to put kids first without giving a raise to those overworked and underpaid teachers, is lying. I would like to make one last suggestion; I would suggest remedial computer classes for Superintendent Ibarra who would have submitted evidence to The Court if only he knew how to do an email search for emails from Trustee Fragozo. The “animal like” treatment of Trustee Jose Fragozo by The Escondido Union School District and the law firm of Stutz, Artiano, Shinoff and Holtz is disgraceful. Disallowing Trustee Fragozo to do the job that the public elected him to do is a clear violation of power by the Superintendent Ibarra and the rest of the EUSD Board of education and destroys our Great American Constitution that many have given their lives to defend. We need a unified school district like neighboring cities have. We do not need 2 sets of administrators. Let’s choose the most functional one, at this point the high school district, and let them run things. Save taxpayers $$$.